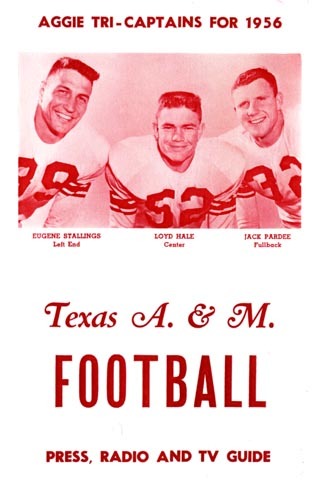 The Aggie co-captions pictured here on the cover were three of the surviving Junction Boys, and they led Coach Bryant's men to their finest season since 1939, culminating a 9-0-1 record with a romp over Texas in the season finale. Gene Stallings went on to an illustrious coaching career at Texas A&M, the NFL and Alabama. Jack Pardee went to the NFL, where he was a two-time All-Pro as a player and a two-time Coach of the Year after that. Lloyd Hale found success in the private sector, and never bore a grudge against the press guide editor for spelling his name wrong.